Congratulations to Maple Elementary School fourth grader Kaden Faenza, who was selected as the next PCLS W-o-W! (Writer-of-the-Week). 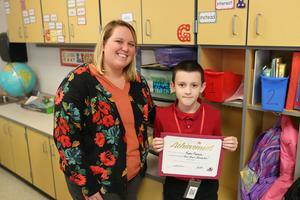 Congratulations to Maple Elementary School fourth grader Kaden Faenza, who was selected as the next PCLS W-o-W! (Writer-of-the-Week). His teacher, Mrs. Amanda Rossignol, submitted his essay because he “has been determined to create great essays and has gotten better with each one. In this essay he was able to organize and elaborate an essay to explain his New Year's resolutions.” Kaden was presented with a certificate of achievement and allowed to choose a prize from the Writer’s Toolbox. The PCLS Curriculum Department/Teaching and Learning Team developed the W-o-W! program to recognize the hard work and creativity of PCLS students. In an effort to help build a community of writers, the team encourages schools to display the W-o-W’s work and asks teachers to use the W-o-W’s work as part of their writing instruction. Kaden will be invited to read his essay at an upcoming board of education meeting.